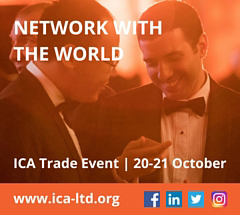 International offering rates broke decisively out of their well-established range during July, following a dramatic upturn in New York that saw the December contract advance by over nine cents per lb in six consecutive sessions, mid-month. 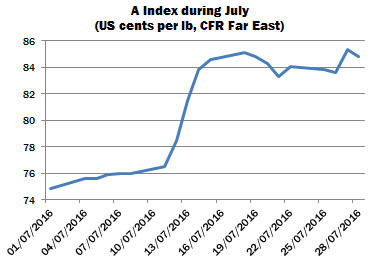 The Cotlook A Index crossed the threshold of 85.00 US cents per lb for the first time since July 2014, and by the end of the month had advanced by over 21 percent since early January. 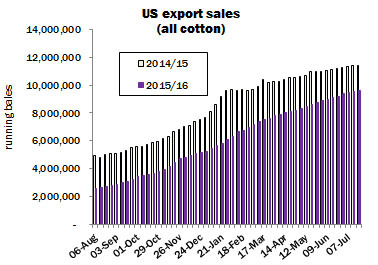 International mill demand remained focused mainly on cotton for nearby delivery, with spinners increasingly conscious of the tight nearby supply situation. However, the sharp increase in sellers’ asking rates inclined some mills, predominantly those who had booked cotton last month or early in the period, and so had some nearby cover, to retreat to the sidelines. India and Bangladesh were active early in the month, but the urgent nature of demand which had previously been in evidence abated with the steep rise in asking rates, and the perception that many mills, particularly in India, have now covered their most pressing requirements, until roughly the time that the new crop will begin to arrive at gin yards. West African remnants, though now very scarce, remained in demand and merchants have remarked that virtually any available cotton from that origin has been snapped up. In that regard, interest has gathered pace for 2016/17 African Franc Zone lots, predominantly from the Indian subcontinent, for first quarter delivery. Brazilian has featured less prominently in recent sales, with the rally in New York pushing asking rates up to a level considered expensive relative to other competing growths. Australian 2016 crop remained in demand from trade holdings; almost all of the crop has now been committed from first hands. Though mill buying was stymied by higher prices, the rally provided the trade with a forward buying opportunity, and a significant portion of new crop raw cotton was taken up during the period, including Australian 2017 and Franc Zone 2016/17, with observers placing the proportion of the West African crop which has been committed from first hands in excess of 60 percent. Thus, although merchants’ current crop holdings are depleted, the past month has witnessed a significant addition to their new crop long positions. US export commitments continued behind the pace of last season, predominantly owing still to reduced sales to China, which are placed around 60 percent behind the volume committed by the same point in 2015. In USDA’s latest report, a total shortfall of almost 1.83 million bales was in evidence from last season, narrowed from over two million one month ago. By July 21, export shipments amounted to some 8.6 million running bales – roughly 250,000 bales will have to be shipped in the intervening period in order for USDA’s export forecast of 9.2 million bales (480 lbs) for the season to be reached. Pockets of import demand emanated from China, but activity was generally focused on the state reserve sales auctions. Turnover on the auctions remained heavy during July, with virtually every session seeing the entire stock offered being purchased. By the end of the month, cumulative sales stood at over 1.63 million tonnes, with close to 60 percent having been sold to the mills and the balance going to local traders. However, in late July, a strong rumour that the government intends to extend the current series through to late September prompted a sharp downturn both in the prices paid at auction, and in Zhengzhou futures. The last session of the month saw less than the total catalogue committed. In our last monthly report, it was asserted that nine million tonnes of raw cotton would remain in Chinese government warehouses at the end of the current auction series, assuming that the entire two million tonnes to be offered would find buyers. However, the widespread expectation that auctions will continue beyond the previously defined timescale has implied a larger inroad may be made into Chinese stocks, perhaps by as much as 600,000 tonnes. The perception that Chinese government stocks may be depleted by a greater volume than previously envisaged in the current season was reflected in USDA’s July global supply and demand report, which saw increases to the consumption figures in both the 2015/16 and 2016/17 seasons of nearly 327,000 tonnes (presumably owing to good participation at state reserve auctions). Cotlook’s July assessment of world production and consumption failed to predict a significant upturn in Chinese consumption. Our figures reflect several caveats, including the volume of Chinese cotton still resting in trade hands, and the discrepancy between Cotlook and USDA production figures. The biggest changes to our production figures for 2016/17 have concerned downward adjustments to India, where sown area has continued to lag behind last year, China, and Brazil. In the former origin, the area discrepancy stood at around 9.4 percent by the end of the month, down from 13 percent one week earlier, and the Southwest monsoon has been active over growing regions of late. However, reports have persisted of reduced area in the Northern Zone, and farmers’ reduced enthusiasm for cotton in some states. Offsetting these reductions has been an increase for the US, owing primarily to higher planted area and lower abandonment, as indicated by USDA. It should be noted that the next report due to be released by USDA, on August 12, will be the first of the season to reflect actual field surveys in the major producing states, and may provide a clearer picture of output in 2016/17. Dry conditions in the major rainfed producing region of West Texas is reported to have taken a toll of yields, and private forecasts anticipate that Washington will reduce its estimate from the 15.8 million bales forecast in July. Cotlook’s assessment of consumption is barely altered, with the envisaged improvement between seasons remaining at a modest 1.4 percent. Hence, global stock levels are estimated to decline by over 2.1 million tonnes in the current season, while in 2016/17, a contraction of over 1.3 million tonnes is in prospect, up from last month. 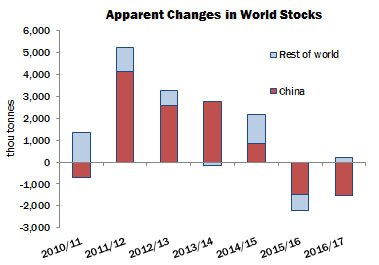 A moderate reduction in the world outside China is anticipated in 2015/16, while at this very early stage, our forecasts indicate that in 2016/17 stocks in the rest of the world are expected to rise very modestly.